I have really enjoyed reading this book and experiencing Katherine’s journey through her life as a person who stutters. I was asked to discuss the major takeaways from this book, which seems difficult because there were so many great challenges, experiences, and successes throughout the book. The two major takeaways that I feel were really important are: 1) ‘stuttering does not have any neat answers’ and 2) ‘happiness and fluency do not walk hand in hand.’ These ideas are so important and are woven throughout the book and really stand out as central themes. The first theme, or idea, relates to the fact that there is no cookie cutter approach to stuttering therapy and no ‘magic pill’. Throughout her life, Katherine is searching for an answer or a ‘cure’ for her stutter, but never really finds it. She describes stuttering as a ‘messy condition full of gray areas’ that will be her ‘steady companion’ for the rest of her life. Through her experiences and growth, she has found some of the answers she was looking for and feels empowered and ‘better armed’ with knowledge and understanding. She becomes better at handling moments of dysfluency and has even learned to laugh at them, instead of allowing them to be defined and archived as the worst days or moments in her life. The second theme is all about Katherine discovering who she is, embracing her stutter and respecting that it has played an important role in the person she has become. At the end of the book, Katherine really speaks about acceptance of her stutter and how it has defined who she is in so many ways. “I have seen all of my flaws and vulnerability lain across every room I have entered. I have witnessed the frailty and strength of my heart. It has made me humble; it has made me cry more violently and love more deeply; it has shown me the finest in people and the worst in them; it has made me sensitive to the world around me.” She says that her stutter is the best part of her in many ways and she isn’t sure who she would be without it. All of her experiences throughout her life have helped define who she is today. After two decades, she realizes that fluency does not equal happiness and that everyone has problems in this ‘messy, complicated’ world, but it is how we choose to address them that determines the power they have over us. After reading this book, I feel it has empowered us as therapists to better understand where a person who stutters comes from and that stuttering is a complex communication disorder with no specific cure that impacts individuals’ lives in so many different ways. Hey all! Welcome back from the weekend! Our second edition of Materials Monday features a new(ish) addition to a site that I have talked about before. ReadWorks is a nonprofit that provides K-12 teachers with reading materials–FREE! I have mentioned the site before, but today I wanted to share the Article-a-day feature. This allows you to curate related articles and gives you a method to cover the articles in about 10 minutes each (this timing is based on a full classroom, so I assume that it could be shortened or stretched out depending on specific student needs.) Check it out and let me know what you think! The EJK Foundation has some great resources for educators, including information to do an author study. There are also some games that might work as a general reinforcer. These dolls might be useful if you are working with younger kiddos! Here is a great opportunity if you have any interest in applying for a small grant. There are several options for visual supports on Boardmaker Share and even a book review with picture supports! Have you used this book in therapy? What supplementary activities have you had success with? This go-around we will be reading articles about fluency/stuttering. Many of you responded that you are interested in this topic and I thought it would be a natural tie-In with our current book study book. We have several options for articles to review. (I have several already, but if you have a suggestion, please let me know!) Depending on the number of people who sign up, you will either have your own article to review or you will work in teams of two. You will have to opportunity to request which of the articles you would like to review. Once the study starts, reviews of two articles will post each week. Like the book study, reviews will post each Wednesday and be due to me by email the Monday prior. You will also be required to post at least 5 responses to other people’s articles. Everyone will need to read each article. If you meet the minimum requirements outlined here, you will receive 3 hours of PD credit. We will not start until January 10th, but I would like to have the articles assigned before break so that you have a chance to read during those 2 weeks if you want. So, here is your chance to sign up! If you would like to participate, please send an email to: Kinsey.chambers@jefferson.kyschools.us by December 1st. **We will not begin the spring book study until this is complete. After experiencing the Speech Easy device with Dr. Tourrey Loucks, Katherine reaches one of her ‘Aha!’ moments. When he uses the device, he becomes quite disfluent, and comments, “We all walk on a tightrope.” She makes a connection with his speech difficulty and realizes that as a person who stutters, she is not an ‘other.’ She considers herself, A person sliding across the human spectrum. Who doesn’t enjoy a love story? I enjoyed Katherine’s account of falling for Jeremy. Katherine titled this chapter, Love as a Medicine, to describe the effect his love had on her stuttering. She revealed that his declaration that she did not need to question his love for her helped her to stop caring what others thought. It was helping her to “escape the judgement of the rest of the world.” Love is powerful. The stuttering conference is when Katherine realized the positive character traits she had as a result of her stuttering. She also reflected on the confessions of many attendees, who admitted to wanting to overcompensate for their difficulty with speech by excelling in other areas of their life. Many of the paragraphs in this chapter begin with, “I have learned…” Katherine learned so much about stuttering, causes, treatment, theories, etc. But this chapter was a reflection on how what she learned changed what she thought about herself in light of her stuttering. 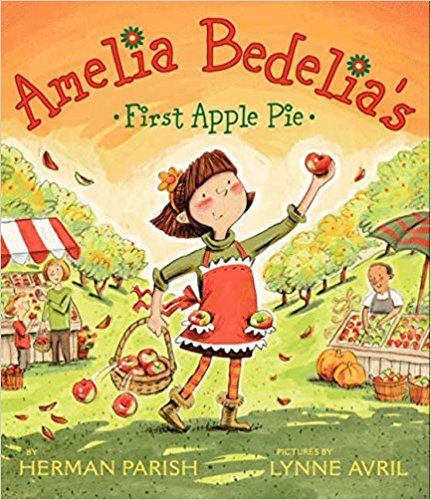 Today, Brooke Becker shares her awesome materials that accompany the book Amelia Bedelia’s First Apple Pie. With these worksheets, you can target WH questions, listening comprehension, retelling, comparing/contrasting, and any articulation sound. This would be an easy tie in with Thanksgiving coming up–because of course apple pie is a staple of the Thanksgiving table! Here is a link to the youtube version of the book, as well. What are you doing in your therapy room this Thanksgiving? Katherine shared many lessons learned and how her feelings about stuttering evolved. She wrote, “I am not magically fixed as the curtain drops.” Did she find the answer she had always hoped for? She emphasized that she still isn’t “normal, whatever that means.” She still stuttered. Katherine compared the way her memories and experiences will stay with her to the way memories and experiences stay with an alcoholic or manic depressive. She also mentioned she still feels like the 7 year old version of herself in some ways. Katherine revealed her thoughts, feelings, and overall change in attitude toward stuttering with strength and maturity. She described the “messiness” and the “gray areas of stuttering.” Katherine moved beyond the belief that her stutter is “something that happened” to her and a barrier that made her different than the rest of the world. She no longer equated happiness and fluency. She learned we are all in a “gray,” “messy,” “complicated world” with vulnerabilities that make us who we are. Katherine described “the power that our vulnerabilities hold over us” and the way she felt stuttering took control of her and took away so much from her. She explained it controlled her appearance, her language, every conversation, and every relationship. Katherine described stuttering as “breathless and painful and scary.” This pain was reflected when she shared she would not wish it on her worst enemy. Katherine learned by embracing our vulnerabilities, “they are totally dismembered.” In the end, she felt she would not be herself without her stutter. She no longer felt like she needed to change that about herself, as it caused her to achieve all she did and to develop many positive qualities. She no longer felt stuttering was an enemy to fight against. Katherine wrote, “It might be the best thing that ever happened to me. In addition, stuttering gave Katherine strength, taught her about love, and taught her to fight the fear of change. She wrote, “We are all designed to be, in the words of Phil Schneider, ‘perfectly imperfect.’” Katherine felt it gave her more than it took from her. It gave her “a fighting instinct” that allowed her to know she would handle anytime life is expectedly not easy. Katherine ended the epilogue by emphasizing “it is our imperfections that ultimately make us beautiful,” and that “they are what give us our humanity and what bring us, finally, into focus.” I am so happy for Katherine in reaction to reading about the acceptance she achieved by the end of the book. I am impressed by the strength she revealed as she shared her thoughts about such an impactful aspect of who she is. I reflected on the experiences and feelings of students while reading the epilogue. I thought about the impact of a 7-year-old’s experiences and feelings. I thought about how the experiences might stay with the individual in the way Katherine’s memories have stayed with her. Have any students said or done anything that reminded you of the experiences Katherine shared? How will you apply what you’ve learned in schools? What did you enjoy or want to be different about the ending of the book? What a great choice for book club! I hope everyone enjoyed it as much as I did.